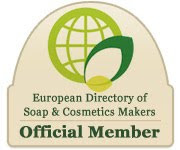 Just a quick reminder that the offer for a free premium listing at the European Directory of Soap & Cosmetics Makers ends tomorrow. If you'd like a listing, please sign up by 10:00am BST. I'll be officially launching the site tomorrow at noon, and I'd like to have all of the listings completed by then. Thanks to everyone who has signed up so far!